Scrooge McDuck and his nephews continue their adventurous ways in more stories inspired by the comic book work of Carl Barks. 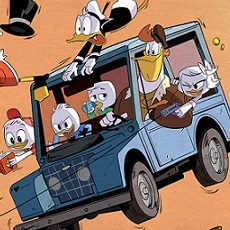 It’s taken a year, but Disney has now brought out a second volume of its landmark series DuckTales. For anyone who caught this show in the Eighties, it represented a new era for quality television from the House Of Mouse. As discussed in our review of the first volume of DuckTales, the show was a homage to the wonderful comic book work of “Unca Carl”, cartoonist Carl Barks. The former story man at the Disney studio spent over two decades working on Disney comic books, where he is now especially known for his Donald Duck stories and as the creator as Uncle Scrooge. For most of his active career, he worked uncredited, but in the 1960s fans discovered his identity. Then, two decades later, he received further recognition when his stories became the basis for Disney’s first syndicated TV series. The most important thing for fans to know is that the second DVD volume of the show corrects the big blunder of the first set. Finally, Disney is including the original pilot adventure, a two-hour story that aired on September 18, 1987. 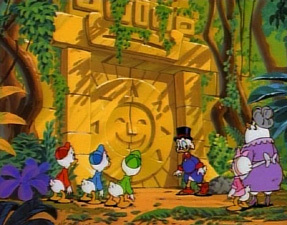 Treasure Of The Golden Suns was a grand start to the show, showcasing everything that the show would become so well known for: globe-trotting adventure, a duel with an old foe, and conflicts within the Duck family that get resolved by the end of the story. The pilot, presented as five separate episodes later on and also on this DVD set, also found a way to get rid of Donald Duck, a move that still does not sit all that well with me, since he usually had an integral role in the Uncle Scrooge comics adventures. Donald’s removal was done to streamline the storytelling later on, since presumably the producers felt that one uncle in the show was enough. 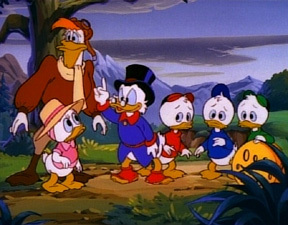 It also allowed more room for new characters to be introduced, principally Scrooge’s pilot Launchpad McQuack, a young girl named Webby, and her grandmother Mrs. Beakley (who serves as the boys’ nanny). While it is hard to imagine DuckTales without any of the new characters, I always found it a shame that Donald got excluded from most episodes. In Treasure Of The Golden Suns, Donald is shown joining the Navy (finally giving his only suit a purpose!) and leaving his nephews Huey, Duey & Louie in Uncle Scrooge’s care. 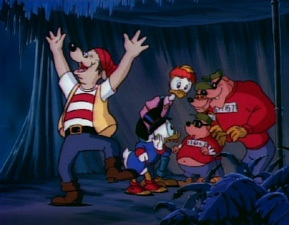 With Donald sent packing, the initial story then saw the three young nephews run afoul of Uncle Scrooge before helping him find a lost treasure ship while travelling to the Andes and Antarctica. For kids accustomed to the syndicated battles of G.I. 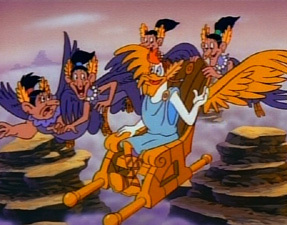 Joe and He-Man, DuckTales offered an alternative type of adventure, one that focused on light-hearted action with a dose of geography and history. 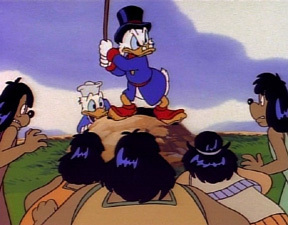 The first DVD volume of DuckTales began with the next episode, Send In The Clones, which did nothing to introduce the show’s core concepts or characters, so it is great to finally have the pilot handy, even in its broken-up version. This second set then picks up where the first set left off. Back To The Klondike is an adaptation of one of Barks’ best-known tales, a look back to his past during the Gold Rush, and his return to the Yukon. What really makes this story different is that Scrooge has a love interest, Glittering Goldie, a gal that Scrooge still loves despite thinking that she betrayed him years ago. 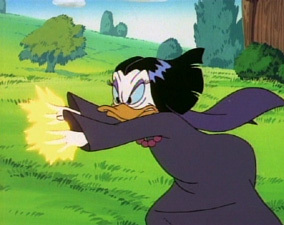 The TV show omits Donald and uses some different motivations for the characters, particularly adding a bad guy to save Goldie from looking too bad herself; but still it is an effective evocation of the original story and one of my favorite episodes. 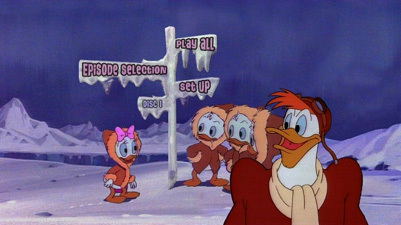 Two more episodes follow on Disc 1, Horse Scents, where Scrooge and his scheming rival Flintheart Glomgold compete with their horses in the Kenducky Derby; and Scrooge’s Pet, where the gift of a pet lemming leads to disaster. The latter story was an adaptation of Barks’ Lemming With A Locket. 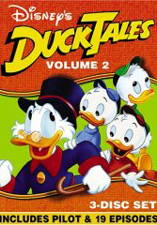 Then, Disc 2 gives us a special four-part story guest-starring Donald Duck, Catch As Cash Can. It’s another competition with Glomgold, this time set up by the Grand Kishke of Macaroon, who has a cavern full of fruit that glow like light bulbs. Donald shows up by the second part, when Scrooge ends up on the Navy ship that Donald is stationed on. By the time the story ends, Scrooge discovers Atlantis! Merit-Time Adventure follows, featuring a story of Scrooge versus a sea serpent. Next, there is another adaptation of a Barks classic, The Golden Fleecing. Here, the fellows search for the famous Golden Fleece, but have to get past its guardians, a group of Harpies. Ducks Of The West gets the Scooby-Doo treatment, as Scrooge investigates whether his oil wells have been targeted by a ghost. Time Teasers ends Disc 2, with a tale involving nutty inventor Gyro Gearloose and his device that stops time. On to Disc 3, an Australian adventure begins things in Back In The Outback. Raiders Of The Lost Harp is certainly reminiscent of a grand Barks adventure, but I do not think it is so. The story involves a magic harp and the machinations of Magica DeSpell. 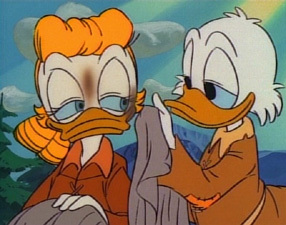 The Right Duck is a fun one that sees Launchpad trying to prove himself to scrooge by becoming an astronaut, only to qualify as the world’s dumbest. Scroogerello is — sigh— a dream story, not my favorite thing; Scrooge dreams he is in a Cinderella-type of story. 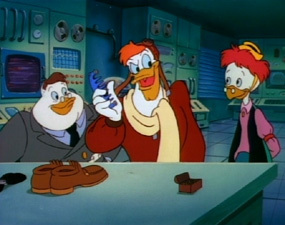 Double-O-Duck is more up my alley, with a fun tale of Launchpad being asked by a spy agency to substitute for his double, a foreign spy named Bruno Von Beak. We find out here that Gyro moonlights for the spy agency, where he is known as “G”. 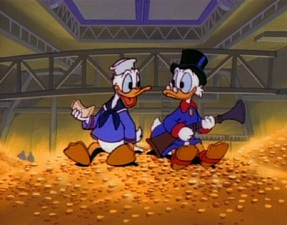 The next one returns to pure fantasy, where Scrooge gets involved with a leprechaun in Luck O’ The Ducks. Next, Scrooge’s butler must take on a new personality to save the boys in Duckworth’s Revolt. Finally, the set ends with a two-in-one episode that has Magica’s Magic Mirror and Take Me Out To The Ballgame. All in all, a pretty nice batch of episodes, particularly given the appearance at last of the pilot. For family-friendly adventure, it is hard to beat DuckTales. Nope, it sure is not loaded. There are only a few Sneak Peeks that play upon loading the first disc, including Peter Pan: Special Edition, Meet The Robinsons, Disney Princess Enchanted Tales: A Kingdom Of Kindness, Cars, and Mickey Saves Santa. Sorry, no points for ads. This was another missed opportunity to present a little info on Carl Barks, so as a long-time fan I am disappointed. Sure, he got a tribute on last year’s Donald Duck set, but something like that really belongs on a DuckTales volume. Obviously, Disney sees this type of set as less worthy of special attention. At least Barks did get story credit in some of the original episode credits. The packaging isn’t anything too special either, though the artwork looks OK. There are three slimcases inside of a slipcase, just as with the first set. Episodes are listed on the back of each slipcase, but no synopses are given. Though the cases are clear, nothing was done in the interiors, where synopses would have been a nice touch. It’s a pretty plain package, really. The only thing to make this set any nicer-looking than the first is the metallic sheen on the disc art. Maybe I’m crazy, but the episodes in this set look a tad better to me than the ones on the first set. While the first set’s episodes looked murky and indistinct, these ones look just a shade sharper and brighter. I hope that Disney actually did a clean-up on these so that I don’t sound like a bozo, but I really think this set looks better than the first. Here, the whole look is brighter and more solid, though the improvement is subtle. Or maybe I’m imagining it. I did do comparisons, though, and I would give the edge to Volume 2, which has fewer tendencies to give in to shimmering or excess grain. Still, the show is looking its age, and is not nearly as sharp as more recent shows on DVD, certainly appearing more dingy than any video on sets from, say, the DC Universe or Cartoon Network shows. The prints look pretty clean, however, and overall I have to say I was satisfied. I wasn’t too impressed with the audio quality on the last set, but this one seems to be a small step up too, though maybe not worthy of a jump in a rating point. I am primarily noticing that the theme song is a little better sounding this time out. On the previous set, the song was oddly distorted, but here it seems less so, unless I’m just used to it now. The rest of the soundtrack also seems to have better fidelity, and while again not in the same league as some modern shows, I was more satisfied than I was with Volume 1. Although, like the video, I am willing to concede that the difference is subtle and perhaps even imagined (or at least dependent on the episode being viewed). If one has not yet purchased DuckTales on DVD, this is the set to get. The inclusion of the pilot is essential viewing to appreciate the rest of the series, and the slightly improved audio and video over the previous volume make this a better buy all-around. Any Scrooge fan also really needs to see Back To The Klondike, and The Golden Fleecing. So, buy this one with some amount of confidence that you are getting the best DuckTales available on DVD so far. I only wish that they would add some extras to these things!